For other uses, see North Pole (disambiguation). Not to be confused with North Magnetic Pole. An azimuthal projection showing the Arctic Ocean and the North Pole. The map also shows the 75th parallel north and 60th parallel north. The North Pole, also known as the Geographic North Pole or Terrestrial North Pole, is (subject to the caveats explained below) defined as the point in the Northern Hemisphere where the Earth's axis of rotation meets its surface. The North Pole is the northernmost point on the Earth, lying diametrically opposite the South Pole. It defines geodetic latitude 90° North, as well as the direction of true north. At the North Pole all directions point south; all lines of longitude converge there, so its longitude can be defined as any degree value. Along tight latitude circles, counterclockwise is east and clockwise is west. The North Pole is at the center of the Northern Hemisphere. While the South Pole lies on a continental land mass, the North Pole is located in the middle of the Arctic Ocean amid waters that are almost permanently covered with constantly shifting sea ice. This makes it impractical to construct a permanent station at the North Pole (unlike the South Pole). However, the Soviet Union, and later Russia, constructed a number of manned drifting stations on a generally annual basis since 1937, some of which have passed over or very close to the Pole. Since 2002, the Russians have also annually established a base, Barneo, close to the Pole. This operates for a few weeks during early spring. Studies in the 2000s predicted that the North Pole may become seasonally ice-free because of Arctic ice shrinkage, with timescales varying from 2016 to the late 21st century or later. The sea depth at the North Pole has been measured at 4,261 m (13,980 ft) by the Russian Mir submersible in 2007 and at 4,087 m (13,410 ft) by USS Nautilus in 1958. The nearest land is usually said to be Kaffeklubben Island, off the northern coast of Greenland about 700 km (430 mi) away, though some perhaps semi-permanent gravel banks lie slightly closer. The nearest permanently inhabited place is Alert in the Qikiqtaaluk Region, Nunavut, Canada, which is located 817 km (508 mi) from the Pole. The Earth's axis of rotation – and hence the position of the North Pole – was commonly believed to be fixed (relative to the surface of the Earth) until, in the 18th century, the mathematician Leonhard Euler predicted that the axis might "wobble" slightly. Around the beginning of the 20th century astronomers noticed a small apparent "variation of latitude," as determined for a fixed point on Earth from the observation of stars. Part of this variation could be attributed to a wandering of the Pole across the Earth's surface, by a range of a few metres. The wandering has several periodic components and an irregular component. The component with a period of about 435 days is identified with the eight-month wandering predicted by Euler and is now called the Chandler wobble after its discoverer. The exact point of intersection of the Earth's axis and the Earth's surface, at any given moment, is called the "instantaneous pole", but because of the "wobble" this cannot be used as a definition of a fixed North Pole (or South Pole) when metre-scale precision is required. It is desirable to tie the system of Earth coordinates (latitude, longitude, and elevations or orography) to fixed landforms. Of course, given plate tectonics and isostasy, there is no system in which all geographic features are fixed. Yet the International Earth Rotation and Reference Systems Service and the International Astronomical Union have defined a framework called the International Terrestrial Reference System. As early as the 16th century, many prominent people correctly believed that the North Pole was in a sea, which in the 19th century was called the Polynya or Open Polar Sea. It was therefore hoped that passage could be found through ice floes at favorable times of the year. Several expeditions set out to find the way, generally with whaling ships, already commonly used in the cold northern latitudes. One of the earliest expeditions to set out with the explicit intention of reaching the North Pole was that of British naval officer William Edward Parry, who in 1827 reached latitude 82°45′ North. In 1871 the Polaris expedition, a US attempt on the Pole led by Charles Francis Hall, ended in disaster. Another British Royal Navy attempt on the pole, part of the British Arctic Expedition, by Commander Albert H. Markham reached a then-record 83°20'26" North in May 1876 before turning back. An 1879–1881 expedition commanded by US naval officer George W. DeLong ended tragically when their ship, the USS Jeanette, was crushed by ice. Over half the crew, including DeLong, were lost. In April 1895 the Norwegian explorers Fridtjof Nansen and Hjalmar Johansen struck out for the Pole on skis after leaving Nansen's icebound ship Fram. The pair reached latitude 86°14′ North before they abandoned the attempt and turned southwards, eventually reaching Franz Josef Land. In 1897 Swedish engineer Salomon August Andrée and two companions tried to reach the North Pole in the hydrogen balloon Örnen ("Eagle"), but came down 300 km (190 mi) north of Kvitøya, the northeasternmost part of the Svalbard archipelago. 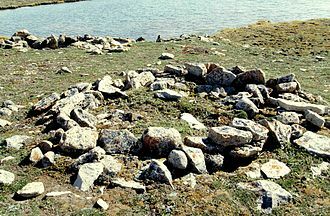 They trekked to Kvitøya but died there three months later. In 1930 the remains of this expedition were found by the Norwegian Bratvaag Expedition. The Italian explorer Luigi Amedeo, Duke of the Abruzzi and Captain Umberto Cagni of the Italian Royal Navy (Regia Marina) sailed the converted whaler Stella Polare ("Pole Star") from Norway in 1899. On 11 March 1900 Cagni led a party over the ice and reached latitude 86° 34’ on 25 April, setting a new record by beating Nansen's result of 1895 by 35 to 40 km (22 to 25 mi). Cagni barely managed to return to the camp, remaining there until 23 June. On 16 August the Stella Polare left Rudolf Island heading south and the expedition returned to Norway. The US explorer Frederick Cook claimed to have reached the North Pole on 21 April 1908 with two Inuit men, Ahwelah and Etukishook, but he was unable to produce convincing proof and his claim is not widely accepted. The conquest of the North Pole was for many years credited to US Navy engineer Robert Peary, who claimed to have reached the Pole on 6 April 1909, accompanied by Matthew Henson and four Inuit men, Ootah, Seeglo, Egingwah, and Ooqueah. However, Peary's claim remains highly disputed and controversial. Those who accompanied Peary on the final stage of the journey were not trained in [Western] navigation, and thus could not independently confirm his navigational work, which some claim to have been particularly sloppy as he approached the Pole. The distances and speeds that Peary claimed to have achieved once the last support party turned back seem incredible to many people, almost three times that which he had accomplished up to that point. Peary's account of a journey to the Pole and back while traveling along the direct line – the only strategy that is consistent with the time constraints that he was facing – is contradicted by Henson's account of tortuous detours to avoid pressure ridges and open leads. The British explorer Wally Herbert, initially a supporter of Peary, researched Peary's records in 1989 and found that there were significant discrepancies in the explorer's navigational records. He concluded that Peary had not reached the Pole. Support for Peary came again in 2005, however, when British explorer Tom Avery and four companions recreated the outward portion of Peary's journey with replica wooden sleds and Canadian Eskimo Dog teams, reaching the North Pole in 36 days, 22 hours – nearly five hours faster than Peary. However, Avery's fastest 5-day march was 90 nautical miles, significantly short of the 135 claimed by Peary. Avery writes on his web site that "The admiration and respect which I hold for Robert Peary, Matthew Henson and the four Inuit men who ventured North in 1909, has grown enormously since we set out from Cape Columbia. Having now seen for myself how he travelled across the pack ice, I am more convinced than ever that Peary did indeed discover the North Pole." The first claimed flight over the Pole was made on 9 May 1926 by US naval officer Richard E. Byrd and pilot Floyd Bennett in a Fokker tri-motor aircraft. Although verified at the time by a committee of the National Geographic Society, this claim has since been undermined by the 1996 revelation that Byrd's long-hidden diary's solar sextant data (which the NGS never checked) consistently contradict his June 1926 report's parallel data by over 100 mi (160 km). The secret report's alleged en-route solar sextant data were inadvertently so impossibly overprecise that he excised all these alleged raw solar observations out of the version of the report finally sent to geographical societies five months later (while the original version was hidden for 70 years), a realization first published in 2000 by the University of Cambridge after scrupulous refereeing. The first consistent, verified, and scientifically convincing attainment of the Pole was on 12 May 1926, by Norwegian explorer Roald Amundsen and his US sponsor Lincoln Ellsworth from the airship Norge. Norge, though Norwegian-owned, was designed and piloted by the Italian Umberto Nobile. The flight started from Svalbard in Norway, and crossed the Arctic Ocean to Alaska. Nobile, with several scientists and crew from the Norge, overflew the Pole a second time on 24 May 1928, in the airship Italia. 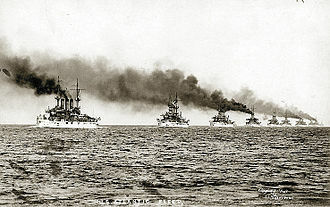 The Italia crashed on its return from the Pole, with the loss of half the crew. The possibility of Peary taking the credit away from African American expedition member Mathew Henson, who may have arrived at the Pole 45 minutes before Peary's arrival, is a debated issue, that during a time when colored people were segregated and abused in America, and had no equal rights, a Caucasian would not allow a man of color to be the first man to discover the North Pole. According to comedian Kevin Hart's Black History program, which attempts to clear up historical inaccuracies and lies which were created to become common beliefs during the era of racist segregation in America, Peary was actually stricken ill before reaching the North Pole, and that the first person to arrive was Matthew Henson, the first African American to go on a polar expedition. Henson was fluent in Inuit language. After Peary failed twice to reach the North Pole, Peary and Henson and a team of Inuit set out for a third expedition in 1909. But on this expedition, it appears that it was not Peary who led the way, rather, the African American Matthew Henson and that records show that Peary became weary and ill before reaching the North Pole, and arrived later assisted by the Inuit, after Mathew Henson had already reached the North Pole. Peary allegedly then invented a tiny discrepancy between his own and Henson's calculations, and moved the flag a very short distance, in order to claim the credit. If true, this means that we had a false measurement of the exact position of the North Pole until recently (where we have enough technology to see the North Pole with scientific instruments). In May 1937 the world's first North Pole ice station, North Pole-1, was established by Soviet scientists by air 20 kilometres (13 mi) from the North Pole. The expedition members: oceanographer Pyotr Shirshov, meteorologist Yevgeny Fyodorov, radio operator Ernst Krenkel, and the leader Ivan Papanin conducted scientific research at the station for the next nine months. By 19 February 1938, when the group was picked up by the ice breakers Taimyr and Murman, their station had drifted 2850 km to the eastern coast of Greenland. In May 1945 an RAF Lancaster of the Aries expedition became the first Commonwealth aircraft to overfly the North Geographic and North Magnetic Poles. The plane was piloted by David Cecil McKinley of the Royal Air Force. It carried an 11-man crew, with Kenneth C. Maclure of the Royal Canadian Air Force in charge of all scientific observations. In 2006, Maclure was honoured with a spot in Canada's Aviation Hall of Fame. 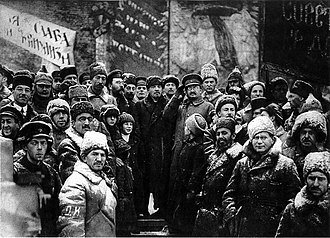 Discounting Peary's disputed claim, the first men to set foot at the North Pole were a Soviet party including geophysicists Mikhail Ostrekin and Pavel Senko, oceanographers Mikhail Somov and Pavel Gordienko, and other scientists and flight crew (24 people in total) of Aleksandr Kuznetsov's Sever-2 expedition (March–May 1948). It was organized by the Chief Directorate of the Northern Sea Route. The party flew on three planes (pilots Ivan Cherevichnyy, Vitaly Maslennikov and Ilya Kotov) from Kotelny Island to the North Pole and landed there at 4:44pm (Moscow Time, UTC+04:00) on 23 April 1948. They established a temporary camp and for the next two days conducted scientific observations. On 26 April the expedition flew back to the continent. Next year, on 9 May 1949 two other Soviet scientists (Vitali Volovich and Andrei Medvedev) became the first people to parachute onto the North Pole. They jumped from a Douglas C-47 Skytrain, registered CCCP H-369. On 3 May 1952 U.S. Air Force Lieutenant Colonel Joseph O. Fletcher and Lieutenant William Pershing Benedict, along with scientist Albert P. Crary, landed a modified Douglas C-47 Skytrain at the North Pole. Some Western sources considered this to be the first landing at the Pole until the Soviet landings became widely known. The United States Navy submarine USS Nautilus (SSN-571) crossed the North Pole on 3 August 1958. On 17 March 1959 USS Skate (SSN-578) surfaced at the Pole, breaking through the ice above it, becoming the first naval vessel to do so. Setting aside Peary's claim, the first confirmed surface conquest of the North Pole was that of Ralph Plaisted, Walt Pederson, Gerry Pitzl and Jean Luc Bombardier, who traveled over the ice by snowmobile and arrived on 19 April 1968. The United States Air Force independently confirmed their position. On 6 April 1969 Wally Herbert and companions Allan Gill, Roy Koerner and Kenneth Hedges of the British Trans-Arctic Expedition became the first men to reach the North Pole on foot (albeit with the aid of dog teams and airdrops). They continued on to complete the first surface crossing of the Arctic Ocean – and by its longest axis, Barrow, Alaska to Svalbard – a feat that has never been repeated. Because of suggestions (later proven false) of Plaisted's use of air transport, some sources classify Herbert's expedition as the first confirmed to reach the North Pole over the ice surface by any means. In the 1980s Plaisted's pilots Weldy Phipps and Ken Lee signed affidavits asserting that no such airlift was provided. It is also said that Herbert was the first person to reach the pole of inaccessibility. On 17 August 1977 the Soviet nuclear-powered icebreaker Arktika completed the first surface vessel journey to the North Pole. In 1982 Ranulph Fiennes and Charles R. Burton became the first people to cross the Arctic Ocean in a single season. They departed from Cape Crozier, Ellesmere Island, on 17 February 1982 and arrived at the geographic North Pole on 10 April 1982. They travelled on foot and snowmobile. From the Pole, they travelled towards Svalbard but, due to the unstable nature of the ice, ended their crossing at the ice edge after drifting south on an ice floe for 99 days. They were eventually able to walk to their expedition ship MV Benjamin Bowring and boarded it on 4 August 1982 at position 80:31N 00:59W. As a result of this journey, which formed a section of the three-year Transglobe Expedition 1979–1982, Fiennes and Burton became the first people to complete a circumnavigation of the world via both North and South Poles, by surface travel alone. This achievement remains unchallenged to this day. In 1985 Sir Edmund Hillary (the first man to stand on the summit of Mount Everest) and Neil Armstrong (the first man to stand on the moon) landed at the North Pole in a small twin-engined ski plane. Hillary thus became the first man to stand at both poles and on the summit of Everest. In 1986 Will Steger, with seven teammates, became the first to be confirmed as reaching the Pole by dogsled and without resupply. USS Gurnard (SSN-662) operated in the Arctic Ocean under the polar ice cap from September to November 1984 in company with one of her sister ships, the attack submarine USS Pintado (SSN-672). On 12 November 1984 Gurnard and Pintado became the third pair of submarines to surface together at the North Pole. In March 1990, Gurnard deployed to the Arctic region during exercise Ice Ex '90 and completed only the fourth winter submerged transit of the Bering and Seas. Gurnard surfaced at the North Pole on April 18, in the company of the USS Seahorse (SSN-669). 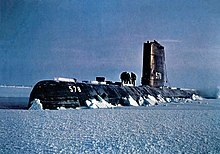 On 6 May 1986 USS Archerfish (SSN 678), USS Ray (SSN 653) and USS Hawkbill (SSN-666) surfaced at the North Pole, the first tri-submarine surfacing at the North Pole. On 21 April 1987 Shinji Kazama of Japan became the first person to reach the North Pole on a motorcycle. On 18 May 1987 USS Billfish (SSN 676), USS Sea Devil (SSN 664) and HMS Superb (S 109) surfaced at the North Pole, the first international surfacing at the North Pole. In 1988 a 13-man strong team (9 Soviets, 4 Canadians) skied across the arctic from Siberia to northern Canada. One of the Canadians, Richard Weber became the first person to reach the Pole from both sides of the Arctic Ocean. On 4 May 1990 Børge Ousland and Erling Kagge became the first explorers ever to reach the North Pole unsupported, after a 58-day ski trek from Ellesmere Island in Canada, a distance of 800 km. On 7 September 1991 the German research vessel Polarstern and the Swedish icebreaker Oden reached the North Pole as the first conventional powered vessels. Both scientific parties and crew took oceanographic and geological samples and had a common tug of war and a football game on an ice floe. Polarstern again reached the pole exactly 10 years later with the Healy. In 1998, 1999, and 2000 Lada Niva Marshs (special very large wheeled versions made by BRONTO, Lada/Vaz's experimental product division) were driven to the North Pole. The 1998 expedition was dropped by parachute and completed the track to the North Pole. The 2000 expedition departed from a Russian research base around 114 km from the Pole and claimed an average speed of 20–15 km/h in an average temperature of −30 °C. Commercial airliner flights on the Polar routes may pass within viewing distance of the North Pole. For example, the flight from Chicago to Beijing may come close as latitude 89° N, though because of prevailing winds return journeys go over the Bering Strait. In recent years journeys to the North Pole by air (landing by helicopter or on a runway prepared on the ice) or by icebreaker have become relatively routine, and are even available to small groups of tourists through adventure holiday companies. Parachute jumps have frequently been made onto the North Pole in recent years. The temporary seasonal Russian camp of Barneo has been established by air a short distance from the Pole annually since 2002, and caters for scientific researchers as well as tourist parties. Trips from the camp to the Pole itself may be arranged overland or by helicopter. The first attempt at underwater exploration of the North Pole was made on 22 April 1998 by Russian firefighter and diver Andrei Rozhkov with the support of the Diving Club of Moscow State University, but ended in fatality. The next attempted dive at the North Pole was organized the next year by the same diving club, and ended in success on 24 April 1999. The divers were Michael Wolff (Austria), Brett Cormick (UK), and Bob Wass (USA). In 2005 the United States Navy submarine USS Charlotte (SSN-766) surfaced through 155 cm (61 in) of ice at the North Pole and spent 18 hours there. In July 2007 British endurance swimmer Lewis Gordon Pugh completed a 1 km (0.62 mi) swim at the North Pole. His feat, undertaken to highlight the effects of global warming, took place in clear water that had opened up between the ice floes. His later attempt to paddle a kayak to the North Pole in late 2008, following the erroneous prediction of clear water to the Pole, was stymied when his expedition found itself stuck in thick ice after only three days. The expedition was then abandoned. By September 2007 the North Pole had been visited 66 times by different surface ships: 54 times by Soviet and Russian icebreakers, 4 times by Swedish Oden, 3 times by German Polarstern, 3 times by USCGC Healy and USCGC Polar Sea, and once by CCGS Louis S. St-Laurent and by Swedish Vidar Viking. 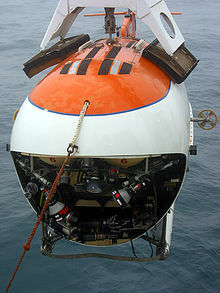 On 2 August 2007 a Russian scientific expedition Arktika 2007 made the first ever manned descent to the ocean floor at the North Pole, to a depth of 4.3 km (2.7 mi), as part of the research programme in support of Russia's 2001 extended continental shelf claim to a large swathe of the Arctic Ocean floor. The descent took place in two MIR submersibles and was led by Soviet and Russian polar explorer Artur Chilingarov. In a symbolic act of visitation, the Russian flag was placed on the ocean floor exactly at the Pole. 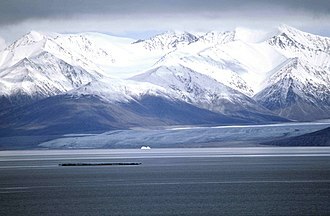 The expedition was the latest in a series of efforts intended to give Russia a dominant influence in the Arctic according to The New York Times. The warming Arctic climate and summer shrinkage of the iced area has attracted the attention of many countries, such as China and the United States, toward the top of the world, where resources and shipping routes may soon be exploitable. In 2009 the Russian Marine Live-Ice Automobile Expedition (MLAE-2009) with Vasily Elagin as a leader and a team of Afanasy Makovnev, Vladimir Obikhod, Alexey Shkrabkin, Sergey Larin, Alexey Ushakov and Nikolay Nikulshin reached the North Pole on two custom-built 6 x 6 low-pressure-tire ATVs — Yemelya-1 and Yemelya-2, designed by Vasily Elagin, a known Russian mountain climber, explorer and engineer. The vehicles reached the North Pole on 26 April 2009, 17:30 (Moscow time). The expedition was partly supported by Russian State Aviation. The Russian Book of Records recognized it as the first successful vehicle trip from land to the Geographical North Pole. On 1 March 2013 the Russian Marine Live-Ice Automobile Expedition (MLAE 2013) with Vasily Elagin as a leader, and a team of Afanasy Makovnev, Vladimir Obikhod, Alexey Shkrabkin, Andrey Vankov, Sergey Isayev and Nikolay Kozlov on two custom-built 6 x 6 low-pressure-tire ATVs — Yemelya-3 and Yemelya-4,— started from Golomyanny Island (the Severnaya Zemlya Archipelago) to the North Pole across drifting ice of the Arctic Ocean. The vehicles reached the Pole on 6 April and then continued to the Canadian coast. The coast was reached on 30 April 2013 (83°08N, 075°59W Ward Hant Island), and on 5 May 2013 the expedition finished in Resolute Bay, NU. The way between the Russian borderland (Machtovyi Island of the Severnaya Zemlya Archipelago, 80°15N, 097°27E) and the Canadian coast (Ward Hant Island, 83°08N, 075°59W) took 55 days; it was ~2300 km across drifting ice and about 4000 km in total. The expedition was totally self-dependent and used no external supplies. The expedition was supported by the Russian Geographical Society. The sun at the North Pole is continuously above the horizon during the summer and continuously below the horizon during the winter. Sunrise is just before the March equinox (around 20 March); the sun then takes three months to reach its highest point of near 23½° elevation at the summer solstice (around 21 June), after which time it begins to sink, reaching sunset just after the September equinox (around 23 September). When the sun is visible in the polar sky, it appears to move in a horizontal circle above the horizon. This circle gradually rises from near the horizon just after the vernal equinox to its maximum elevation (in degrees) above the horizon at summer solstice and then sinks back toward the horizon before sinking below it at the autumnal equinox. Hence the North and South Poles experience the slowest rates of sunrise and sunset on Earth. an astronomical twilight period of about seven weeks. These effects are caused by a combination of the Earth's axial tilt and its revolution around the sun. The direction of the Earth's axial tilt, as well as its angle relative to the plane of the Earth's orbit around the sun, remains very nearly constant over the course of a year (both change very slowly over long time periods). At northern midsummer the North Pole is facing towards the sun to its maximum extent. As the year progresses and the Earth moves around the sun, the North Pole gradually turns away from the sun until at midwinter it is facing away from the Sun to its maximum extent. A similar sequence is observed at the South Pole, with a six-month time difference. In most places on Earth, local time is determined by longitude, such that the time of day is more-or-less synchronised to the position of the sun in the sky (for example, at midday the sun is roughly at its highest). This line of reasoning fails at the North Pole, where the sun rises and sets only once per year, and all lines of longitude, and hence all time zones, converge. There is no permanent human presence at the North Pole and no particular time zone has been assigned. Polar expeditions may use any time zone that is convenient, such as Greenwich Mean Time, or the time zone of the country from which they departed. 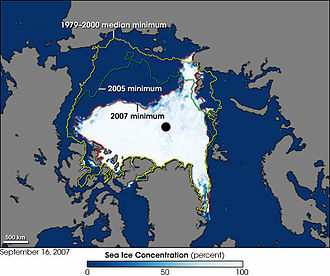 Arctic ice shrinkages of 2007 compared to 2005 and also compared to the 1979–2000 average. The North Pole is substantially warmer than the South Pole because it lies at sea level in the middle of an ocean (which acts as a reservoir of heat), rather than at altitude on a continental land mass. Despite being an ice cap, it shares some characteristics with a tundra climate (ETf) due to the July and August temperatures peaking just above freezing. Winter temperatures at the northernmost weather station in Greenland can range from about −50 to −13 °C (−58 to 9 °F), averaging around −31 °C (−24 °F), with the North Pole being slightly colder.A However, a freak storm caused the temperature to reach 0.7 °C (33 °F) for a time at a World Meteorological Organization buoy, located at 87.45°N, on December 30, 2015. It was estimated that the temperature at the North Pole was between 30 and 35 °F (−1 and 2 °C) during the storm. Summer temperatures (June, July, and August) average around the freezing point (0 °C (32 °F)). The highest temperature yet recorded is 13 °C (55 °F), much warmer than the South Pole's record high of only −12.3 °C (9.9 °F). A similar spike in temperatures occurred on November 15, 2016 when temperatures hit freezing. Yet again, February 2018 featured a storm so powerful that temperatures at Cape Morris Jesup, the world's northernmost weather station in Greenland, reached 6.1 °C (43 °F) and spent 24 straight hours above freezing. Meanwhile, the pole itself was estimated to reach a high temperature of 1.6 °C (35 °F). This same temperature of 1.6 °C (35 °F) was also recorded at the Hollywood Burbank Airport in Los Angeles at the very same time. The sea ice at the North Pole is typically around 2 to 3 m (6 ft 7 in to 9 ft 10 in) thick, although ice thickness, its spatial extent, and the fraction of open water within the ice pack can vary rapidly and profoundly in response to weather and climate. Studies have shown that the average ice thickness has decreased in recent years. It is likely that global warming has contributed to this, but it is not possible to attribute the recent abrupt decrease in thickness entirely to the observed warming in the Arctic. Reports have also predicted that within a few decades the Arctic Ocean will be entirely free of ice in the summer. This may have significant commercial implications; see "Territorial Claims," below. The retreat of the Arctic sea ice will accelerate global warming, as less ice cover reflects less solar radiation, and may have serious climate implications by contributing to Arctic cyclone generation. Polar bears are believed to travel rarely beyond about 82° North owing to the scarcity of food, though tracks have been seen in the vicinity of the North Pole, and a 2006 expedition reported sighting a polar bear just 1 mi (1.6 km) from the Pole. The ringed seal has also been seen at the Pole, and Arctic foxes have been observed less than 60 km (37 mi) away at 89°40′ N.
Birds seen at or very near the Pole include the snow bunting, northern fulmar and black-legged kittiwake, though some bird sightings may be distorted by the tendency of birds to follow ships and expeditions. Fish have been seen in the waters at the North Pole, but these are probably few in number. A member of the Russian team that descended to the North Pole seabed in August 2007 reported seeing no sea creatures living there. However, it was later reported that a sea anemone had been scooped up from the seabed mud by the Russian team and that video footage from the dive showed unidentified shrimps and amphipods. Currently, under international law, no country owns the North Pole or the region of the Arctic Ocean surrounding it. The five surrounding Arctic countries, Russian Federation, Canada, Norway, Denmark (via Greenland), and the United States, are limited to a 200-nautical-mile (370 km; 230 mi) exclusive economic zone off their coasts, and the area beyond that is administered by the International Seabed Authority. Upon ratification of the United Nations Convention on the Law of the Sea, a country has 10 years to make claims to an extended continental shelf beyond its 200-mile exclusive economic zone. If validated, such a claim gives the claimant state rights to what may be on or beneath the sea bottom within the claimed zone. Norway (ratified the convention in 1996), Russia (ratified in 1997), Canada (ratified in 2003) and Denmark (ratified in 2004) have all launched projects to base claims that certain areas of Arctic continental shelves should be subject to their sole sovereign exploitation. In 1907 Canada invoked a "sector principle" to claim sovereignty over a sector stretching from its coasts to the North Pole. This claim has not been relinquished, but was not consistently pressed until 2013. In some children's Western cultures, the geographic North Pole is described as the location of Santa Claus' workshop and residence, although the depictions have been inconsistent between the geographic and magnetic North Pole. Canada Post has assigned postal code H0H 0H0 to the North Pole (referring to Santa's traditional exclamation of "Ho ho ho!"). 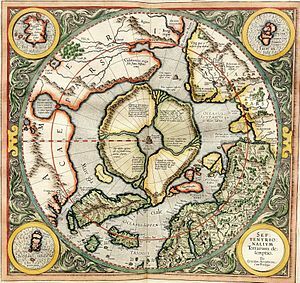 This association reflects an age-old esoteric mythology of Hyperborea that posits the North Pole, the otherworldly world-axis, as the abode of God and superhuman beings..
As Henry Corbin has documented, the North Pole plays a key part in the cultural worldview of Sufism and Iranian mysticism. "The Orient sought by the mystic, the Orient that cannot be located on our maps, is in the direction of the north, beyond the north." A.^ Data is from a Greenlandic Weather Station at 83°38′N 033°22′W﻿ / ﻿83.633°N 33.367°W﻿ / 83.633; -33.367﻿ (Greenlandic Weather Station) located 709 km (441 mi) from the North Pole. ^ Андерсон, Уильям Роберт (1965). ""Наутилус" у Северного полюса". Воениздат. Retrieved 12 January 2012. ^ Mouton, M.W. (1968). The International Regime of the Polar Regions. Acadimie de Droit International de La Ha. pp. 202 (34). ISBN 978-9028614420. Retrieved 12 January 2012. ^ Wright, John K. (July 1953). "The Open Polar Sea". Geographical Review. 43 (3): 338–365. doi:10.2307/211752. JSTOR 211752. ^ "At the North Pole, 6–7 April 1909: Newfoundland and Labrador Heritage Web". Heritage.nf.ca. Archived from the original on 22 May 2013. Retrieved 16 February 2011. ^ "Sir Wally Herbert". The Independent. 16 June 2007. Archived from the original on 24 December 2008. ^ a b Roald Amundsen First to Each Pole – Three Prior North Pole Claims: Each Unproven & Highly Suspect. Dioi.org. Retrieved 4 July 2012. ^ The North Pole Flight of Richard E. Byrd: An Overview of the Controversy Archived 13 October 2007 at the Wayback Machine, Byrd Polar Research Center of The Ohio State University. See also DIO Vol. 10  (refereed both at University of Cambridge and by the DIO board), which reveals errors of grade school arithmetic in the Byrd-defenses of W.Molett (pp. 55 & 98) and consultant J. Portney (pp. 73–75), neither of whom attempts to explain Byrd's surgical censoring of his original June report, or his and the National Geographic's hiding of said report for decades. Similarly, Avery's chimeral try at replicating the Peary 1909 trip via 2005 ice, may divert from but cannot explain Peary's data-blanks, data-alterations, nor why he, when reading his diary to Congress on 7 January 1911, understandably deleted (only) its sole attempt at explaining (crudely and inadequately) his steering: "setting course by moon, our shadows etc". See The Washington Post 20 April 1989. Compare diary 2 April 1909 to p. 302 of the Peary Hearings: complete verbatim copy at 1916 Congressional Record Vol. 53, Appendix pp. 293–327. ^ Did Byrd Reach Pole? His Diary Hints 'No'. The New York Times. (9 May 1996). Retrieved 2012-07-04. ^ D. Rawlins Polar Record (Scott Polar Research Institute) vol. 36 pp. 25–50. SPRI's preface: the paper "is considered to be of such significance to the community that it has been published here despite an expanded version being published this same month in DIO." Both versions (p. 38 and 59, respectively) note that while Byrd's New York ticker-tape parade and his National Geographic Society gold medal presentation were on 23 June 1926, the NGS exam of his later-hidden original report was from early 23 June through late 28 June (six days, mistakenly cited as "five consecutive days" in the report), a chronology so revealing that the September National Geographic pp. 384–385 stripped out the dates (only) from the NGS' own report, which was published uncensored (thanks to the Secretary of the Navy) at The New York Times 30 June, p. 5. ^ Tierney, John. (7 September 2009) Who Was First at the North Pole?. Tierneylab.blogs.nytimes.com. Retrieved 2012-07-04. ^ "North Pole Drifting Stations (1930s–1980s)". Woods Hole Oceanographic Institution. 17 August 2011. Retrieved 8 January 2012. ^ Lockerby, Patrick (15 July 2010). "Arctic Heroes #2 – North Pole 1". Retrieved 8 January 2012. ^ Armstrong, Terence (2011). The Russians in the Arctic. Nabu Press. ISBN 978-1-245-58209-4. Retrieved 8 January 2012. ^ Mills, William James (2003). Exploring polar frontiers: a historical encyclopedia. ABC-CLIO. ISBN 978-1-57607-422-0. Retrieved 9 January 2012. ^ "Советские граждане были доставлены на точку Северного полюса, где, образно говоря, проходит земная ось". Вокруг Света. Retrieved 8 January 2012. ^ "Concise chronology of approach to the poles". Scott Polar Research Institute (SPRI). 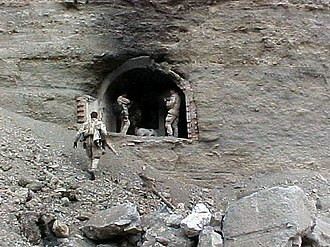 February 2001. Retrieved 9 January 2012. ^ "Высокоширотная воздушная экспедиция "Север-2" (1948 г.)". ФГБУ "Арктический и антарктический научно-исследовательский институт" (ФГБУ "ААНИИ"). 2005–2008. Archived from the original on 3 February 2010. Retrieved 9 January 2012. ^ Уфаркин, Николай Васильевич. "Черевичный Иван Иванович". Патриотический интернет проект "Герои Страны". Retrieved 12 January 2012. ^ Loginov, Dmitri. "Великий полярный водоворот просыпается". Archived from the original on 11 November 2013. Retrieved 9 January 2012. ^ "Volovich Vitaly Georgievich". Polar World. Archived from the original on 18 December 2008. Retrieved 9 January 2012. ^ Barlow, John Matthew (29 July 2010). "The Cold War in the Arctic" (PDF). Canadian Defence and Foreign Affairs Institute (CDFAI). Archived from the original (PDF) on 5 June 2013. Retrieved 9 January 2012. ^ "Arctic Aerial Exploration". Retrieved 9 January 2012. ^ Safronov, Ivan, Jr. (29 July 2009). "Десантников отправят на Северный полюс". 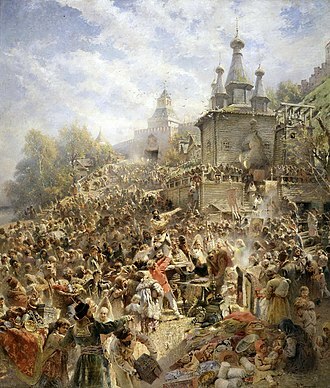 Коммерсантъ. Retrieved 9 January 2012. ^ Jenny Booth (13 June 2007). 'Greatest polar explorer' Sir Wally Herbert dies, The Times. ^ a b Bob Headland (15 June 2007). Sir Wally Herbert, The Guardian. ^ Polar History Archived 11 August 2007 at the Wayback Machine. northpolewomen.com. Retrieved 4 July 2012. ^ Ramstad, C.J. & Pickering, Keith (2011). First to the Pole. North Star Press. ISBN 978-0-87839-446-3. ^ Sir Wally Herbert. Polarworld.co.uk. Retrieved 4 July 2012. ^ Bruhns, Sarah (27 August 2013) When Neil Armstrong and Edmund Hillary Took a Trip to the North Pole. atlasobscura.com. Retrieved 9 September 2013. ^ "North and South Pole successful". ExplorersWeb Inc. 16 June 2004. Retrieved 10 December 2012. ^ "Japanese Is First to Reach North Pole by Motorcycle". Associated Press. 21 April 1987. Retrieved 10 December 2012. ^ First people to reach the north pole. Guinnessworldrecords.com. Retrieved 4 July 2012. ^ Rosloot, Hans "Amphihans". "The Amphiclopedia Vi to Wa". amphibiousvehicle.net. ^ Cormick, Brett (February 2000). "Diving the top of the world". Diver. Archived from the original on 24 March 2012. Retrieved 9 January 2012. ^ Ozeck, Dave (12 January 2005) USS Charlotte Achieves Milestone During Under-Ice Transit. news.navy.mil. ^ Swimmer rises to Arctic challenge, BBC news (15 July 2007). ^ Банько, Юрий (19 September 2007). 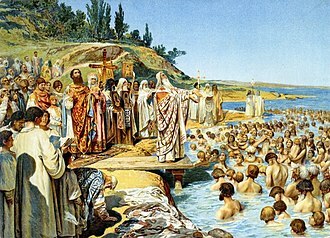 "Вчера и сегодня мы – первые. А завтра?". Российская газета. Retrieved 9 January 2012. ^ (in Russian) «Академик Федоров» – выходит из порта Санкт-Петербург в экспедицию «Арктика-2007». Press release of the AARI (9 July 2007). ^ a b Russia plants flag under N Pole, BBC News (2 August 2007). ^ Russia’s North Pole Obsession, The New York Times (2 August 2007). ^ "The Big Melt", The New York Times (October 2005). ^ "Diary of MLAE-2013". yemelya.ru. ^ Fritz, Angela; Fritz, Angela (30 December 2015). "Freak storm pushes North Pole 50 degrees above normal to melting point" – via washingtonpost.com. ^ a b "CLOSEST DATA FOR NORTH POLE - 440 MI/709 KM, GREENLAND". Weatherbase. Retrieved 19 September 2015. ^ "Bizarre Temperatures: North Pole Rises Above Freezing While Parts of Russia Plunge Below -40 Degrees". ^ "February 2018 heatwave across the Far North". NOAA. ^ "NOWData - NOAA Online Weather Data". NOAA/NWS. ^ "Sea Ice". State of the Cryosphere. NSIDC. Retrieved 6 March 2012. ^ "Arctic ice thickness drops by up to 19 percent", The Daily Telegraph (28 October 2008). ^ "Model-Based Estimates of Change". IPCC. Retrieved 6 March 2012. ^ Jonathan Amos (12 December 2006). Arctic sea ice "faces rapid melt", BBC. ^ "Future of Arctic Climate and Global Impacts". NOAA. Archived from the original on 9 September 2013. Retrieved 6 March 2012. ^ Explorers' Blog Archived 13 October 2007 at the Wayback Machine, Greenpeace Project Thin Ice (1 July 2006). ^ a b "FARTHEST NORTH POLAR BEAR (Ursus maritimus)" (PDF). Retrieved 16 February 2011. ^ "United Nations Convention on the Law of the Sea (Annex 2, Article 4)". Retrieved 26 July 2007. ^ a b c d Status of the United Nations Convention on the Law of the Sea, of the Agreement relating to the implementation of Part XI of the Convention and of the Agreement for the implementation of the provisions of the Convention relating to the conservation and management of straddling fish stocks and highly migratory fish stocks. un.org (4 June 2007). ^ "Territorial claims in the Arctic" (PDF). Archived from the original (PDF) on 8 August 2008. Retrieved 16 February 2011. ^ Noronha, Charmaine (9 December 2013). "Canada plans claim that would include North Pole". 9 December 2013. Associated Press. Retrieved 9 December 2013. ^ "Arctic Sovereignty: Loss by Dereliction?". Northern Perspectives. 22 (4). Winter 1994–1995. Archived from the original on 23 November 2010. Retrieved 16 February 2011. ^ Jeffers, Harry Paul (2000). Legends of Santa Claus. Twenty-First Century Books. p. 20. ISBN 978-0-8225-4983-3. ^ "Meet your neighbor: Santa Claus of the North Pole". ^ "Canada Post Launches 24th Annual Santa Letter-writing Program – Post Office Sends Joy to Salvation Army with $25,000 Donation". Canada Post. 15 November 2006. Archived from the original on 11 April 2008. ^ Godwin, Joscelyn (1993). Arktos: The Polar Myth in Science, Symbolism, and Nazi Survival. Grand Rapids: Phanes Press. ISBN 978-0932813350. ^ Irgam Yigfagna. al-Jabal al-Lamma. ^ Irgam Yigfagna. al-Jabal al-Lamma. p. 44. ^ Irgam Yigfagna. al-Jabal al-Lamma. p. 11. Pal, Christopher (2002). The Oddest Place on Earth: Rediscovering the North Pole. Writer's Showcase. ISBN 978-0-595-21454-9. Fairfield, William (1885). Paradise Found a Cradle of the Human Race at the North Pole a Study of the Prehistoric World. Houghton, Mifflin. ISBN 978-0-665-37759-4. 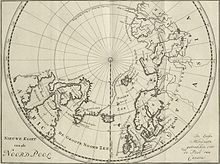 Wikimedia Commons has media related to North Pole. Admiral Sir Albert Hastings Markham, KCB was a British explorer and officer in the Royal Navy. In 1903 he was made Knight Commander in the Order of the Bath and he died in London, England at the age of 76. He is remembered for designing the flag of New Zealand, Albert Markham was the fifth son of Captain John Markham, who had retired from the navy because of ill health with the rank of lieutenant. John Markhams grandfather, William Markham, had been Archbishop of York, Albert was born in Bagnères-de-Bigorre in the Hautes-Pyrénées department of France, where the family lived before moving to a farm on Guernsey. At age thirteen Albert was sent to London to live with his aunt, neighbours included the explorer Vice-Admiral Robert FitzRoy and novelist William Thackeray. He was educated at home and at Eastmans Royal Naval Academy, Markhams father was short of money for his education and had for some time tried to find a naval officer willing to sponsor Albert for admission to the navy. He only succeeded in doing so after Albert had passed the entry age of fourteen. His aunts son Clements Markham, who was eleven years older than Albert, had joined the navy before leaving to become a geographer and explorer. He became a friend to his cousin Albert and exerted a considerable influence on his career. When away from Clements and his wife Minna, who for much of his life he regarded as his family, Albert was often moody, irritable. He had a sense of duty as a naval officer, which compelled him to serve with a strict adherence to rules and established practices. He did not smoke, allowing that a gentleman might have an occasional cigar, but believing that cigarettes were for effeminate weaklings and he did not drink and disapproved of those who did. 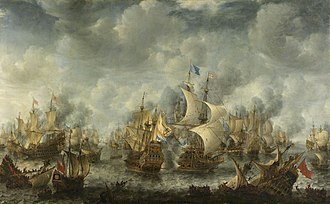 He found it difficult to socialise with other officers and he disliked the peacetime navy, with its endless social engagements and ritual displays. Markhams family emigrated to the United States and John Markham bought a farm at La Crosse in Wisconsin, Albert visited them twice and he was unimpressed. He found the slow, the hotels disreputable, and travelling companions murderous. Greenland is an autonomous constituent country within the Danish Realm between the Arctic and Atlantic Oceans, east of the Canadian Arctic Archipelago. Though physiographically a part of the continent of North America, Greenland has been politically and culturally associated with Europe for more than a millennium. The majority of its residents are Inuit, whose ancestors began migrating from the Canadian mainland in the 13th century, Greenland is the worlds largest island. Three-quarters of Greenland is covered by the permanent ice sheet outside Antarctica. With a population of about 56,480, it is the least densely populated country in the world, the Arctic Umiaq Line ferry acts as a lifeline for western Greenland, connecting the various cities and settlements. Greenland has been inhabited off and on for at least the last 4,500 years by Arctic peoples whose forebears migrated there from what is now Canada, Norsemen settled the uninhabited southern part of Greenland beginning in the 10th century, and Inuit peoples arrived in the 13th century. The Norse colonies disappeared in the late 15th century, soon after their demise, beginning in 1499, the Portuguese briefly explored and claimed the island, naming it Terra do Lavrador. 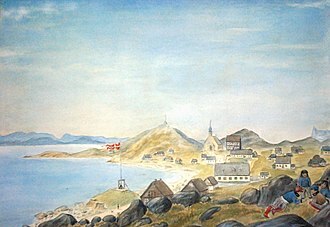 In the early 18th century, Scandinavian explorers reached Greenland again, to strengthen trading and power, Denmark-Norway affirmed sovereignty over the island. Greenland was settled by Vikings more than a thousand years ago, Vikings set sail from Greenland and Iceland, discovering North America nearly 500 years before Columbus reached Caribbean islands. 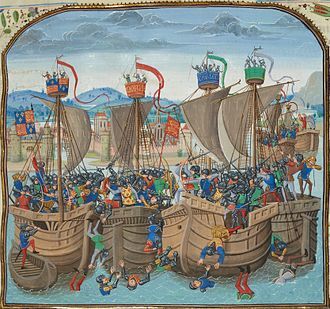 Though under continuous influence of Norway and Norwegians, Greenland was not formally under the Norwegian crown until 1262, the Kingdom of Norway was extensive and a military power until the mid-14th century. Thus, the two kingdoms resources were directed at creating Copenhagen, Norway became the weaker part and lost sovereignty over Greenland in 1814 when the union was dissolved. Greenland became a Danish colony in 1814, and was made a part of the Danish Realm in 1953 under the Constitution of Denmark, in 1973, Greenland joined the European Economic Community with Denmark. Fram is a ship that was used in expeditions of the Arctic and Antarctic regions by the Norwegian explorers Fridtjof Nansen, Otto Sverdrup, Oscar Wisting, and Roald Amundsen between 1893 and 1912. Fram is said to have sailed north and farther south than any other wooden ship. Fram is preserved at the Fram Museum in Oslo, nansens ambition was to explore the Arctic farther north than anyone else. To do that, he would have to deal with a problem that many sailing on the ocean had encountered before him. Fram is a schooner with a total length of 39 meters. 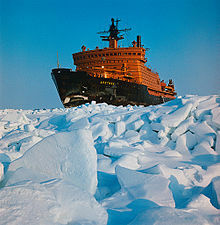 The ship is both wide and unusually shallow in order to better withstand the forces of pressing ice. Nansen commissioned the shipwright Colin Archer from Larvik to construct a vessel with these characteristics, Fram was built with an outer layer of greenheart wood to withstand the ice and with almost no keel to handle the shallow waters Nansen expected to encounter. The rudder and propeller were designed to be retracted, the ship was carefully insulated to allow the crew to live on board for up to five years. The ship included a windmill, which ran a generator to provide power for lighting by electric arc lamps. Initially, Fram was fitted with a steam engine, prior to Amundsens expedition to the South Pole in 1910, the engine was replaced with a diesel engine, a first for polar exploration vessels. Nansen had Fram built in order to explore this theory and he undertook an expedition that came to last three years. When Nansen realised that Fram would not reach the North Pole directly by the force of the current, he, after reaching 86°14 north, he had to turn back to spend the winter at Franz Joseph Land. Nansen and Johansen survived on walrus and polar bear meat and blubber, finally meeting British explorers, the Jackson-Harmsworth Expedition, they arrived back in Norway only days before the Fram returned there. The ship had spent nearly three years trapped in the ice, reaching 85°57 N, in 1898, Otto Sverdrup, who had brought Fram back on the first Arctic voyage, led a scientific expedition to the Canadian Arctic Archipelago. The Arctic Ocean is the smallest and shallowest of the worlds five major oceans. Alternatively, the Arctic Ocean can be seen as the northernmost part of the all-encompassing World Ocean, located mostly in the Arctic north polar region in the middle of the Northern Hemisphere, the Arctic Ocean is almost completely surrounded by Eurasia and North America. It is partly covered by sea ice throughout the year and almost completely in winter, the summer shrinking of the ice has been quoted at 50%. The US National Snow and Ice Data Center uses satellite data to provide a record of Arctic sea ice cover. The Arctic may become ice free for the first time in human history within a few years or by 2040, for much of European history, the north polar regions remained largely unexplored and their geography conjectural. He was probably describing loose sea ice known today as growlers or bergy bits, his Thule was probably Norway, early cartographers were unsure whether to draw the region around the North Pole as land or water. The makers of navigational charts, more conservative than some of the more fanciful cartographers, tended to leave the region blank and this lack of knowledge of what lay north of the shifting barrier of ice gave rise to a number of conjectures. In England and other European nations, the myth of an Open Polar Sea was persistent, john Barrow, longtime Second Secretary of the British Admiralty, promoted exploration of the region from 1818 to 1845 in search of this. In the United States in the 1850s and 1860s, the explorers Elisha Kane, even quite late in the century, the eminent authority Matthew Fontaine Maury included a description of the Open Polar Sea in his textbook The Physical Geography of the Sea. Nevertheless, as all the explorers who travelled closer and closer to the reported, the polar ice cap is quite thick. Fridtjof Nansen was the first to make a crossing of the Arctic Ocean. The first surface crossing of the ocean was led by Wally Herbert in 1969, in a dog sled expedition from Alaska to Svalbard, with air support. A polynya /pəˈlɪnjə/ is an area of open water surrounded by sea ice. It is now used as term for an area of unfrozen sea within the ice pack. It is a loanword from Russian, полынья Russian pronunciation, which refers to an ice hole. In past decades, for example, some polynyas, such as the Weddell Polynya, have lasted over multiple winters and this reduces ice production and may stop it altogether. Latent heat polynya, is formed through the action of wind or ocean currents which act to drive ice away from a fixed boundary, such as a coastline, fast ice. The polynya forms initially by the first year pack ice being driven away from the coast and this new ice is also herded downwind toward the first year pack ice. When it reaches the ice the new ice is consolidated onto the pack ice. The latent heat polynya is the water region between the coast and the ice pack. Latent heat polynyas are regions of ice production and therefore are possible sites of dense water production in both polar regions. The high ice production rates within these polynyas leads to an amount of brine rejection into the surface waters. USS Nautilus was the worlds first operational nuclear-powered submarine. The vessel was the first submarine to complete a submerged transit of the North Pole on 3 August 1958, in operation, she revealed a number of limitations in her design and construction. This information was used to improve subsequent submarines, Nautilus was decommissioned in 1980 and designated a National Historic Landmark in 1982. The submarine has been preserved as a ship in Groton, Connecticut. On 12 December 1951 the US Department of the Navy announced that the submarine would be called Nautilus, the boat carried the hull number SSN-571. The Nautilus benefited from the GUPPY improvements to the American Gato-, Balao-, nautiluss keel was laid at General Dynamics Electric Boat Division in Groton, Connecticut by Harry S. Truman on 14 June 1952. She was christened on 21 January 1954 and launched into the Thames River, nuclear power had the crucial advantage in submarine propulsion because it is a zero-emission process that consumes no air. This design is the basis for all of the US nuclear-powered submarine and surface combat ships. The first actual prototype was constructed and tested by the Argonne National Laboratory in 1953 at the S1W facility, part of the National Reactor Testing Station in Idaho. Nautilus ships patch was designed by The Walt Disney Company, and her wardroom currently displays a set of made of zirconium. 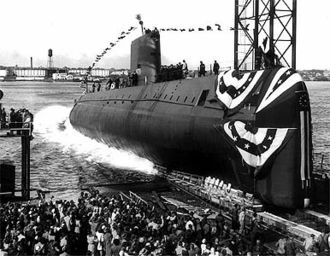 Following her commissioning, Nautilus remained dockside for further construction and testing, at 11 a. m. on 17 January 1955 she put to sea for the first time and signaled her historic message, Underway on nuclear power. On 10 May, she headed south for shakedown, submerged throughout, she traveled 1,100 nautical miles from New London to San Juan, Puerto Rico and covered 1,200 nautical miles in less than ninety hours. At the time, this was the longest submerged cruise by a submarine, from 1955 to 1957, Nautilus continued to be used to investigate the effects of increased submerged speeds and endurance. The improvements rendered the progress made in anti-submarine warfare during World War II virtually obsolete, on 4 February 1957, Nautilus logged her 60, 000th nautical mile, matching the endurance of her namesake, the fictional Nautilus described in Jules Vernes novel Twenty Thousand Leagues Under The Sea. The Polaris expedition was led by the American Charles Francis Hall, who intended it to be the first expedition to reach the North Pole. Sponsored by the United States government, it was one of the first serious attempts at the Pole, after that of British naval officer William Edward Parry, the expedition failed at its main objective, having been troubled throughout by insubordination and poor leadership. Under Halls command, the Polaris departed from New York City in June 1871, by October, the men were wintering on the shore of northern Greenland, making preparations for the trip to the Pole. Hall returned to the ship from an exploratory sledging journey, before he died, he accused members of the crew of poisoning him. An exhumation of his body in 1968 revealed that he had ingested a large quantity of arsenic in the last two weeks of his life, the expeditions notable achievement was reaching 82°29N latitude by ship, a record at the time. On the way southward, nineteen members of the expedition became separated from the ship, the damaged Polaris was run aground and wrecked near Etah, Greenland, in October 1872. The remaining men were able to survive the winter, and were rescued the following summer, a naval board of inquiry investigated Halls death, but no charges were ever laid. In 1827, William Edward Parry led a British Royal Navy expedition with the aim to be the first men to reach the North Pole, Hall had no special academic background or sailing experience, but he was a voracious reader with an obsession for the Arctic. After John Franklins 1845 expedition was lost, Halls focus was directed toward the Arctic and he was able to launch two expeditions in search of Franklin and his crew, one in 1860–63, and a second in 1864–69. These experiences established him as a seasoned Arctic explorer, and gave him valuable contacts among the Inuit people, the renown he gained eventually allowed him to convince the United States government to fund his third expedition, an attempt on the North Pole. In 1870, a bill was introduced in the Senate called the Arctic Resolution and he secured the U. S. Navy tugboat Periwinkle, a 387-ton screw-propelled steamer. He introduced much of the modern mathematical terminology and notation, particularly for mathematical analysis, such as the notion of a mathematical function. He is known for his work in mechanics, fluid dynamics, astronomy, Euler was one of the most eminent mathematicians of the 18th century, and is held to be one of the greatest in history. He is considered to be the most prolific mathematician of all time. His collected works fill 60 to 80 quarto volumes, more than anybody in the field and he spent most of his adult life in Saint Petersburg, and in Berlin, the capital of Prussia. A statement attributed to Pierre-Simon Laplace expresses Eulers influence on mathematics, Read Euler, read Euler, Leonhard Euler was born on 15 April 1707, in Basel, Switzerland to Paul III Euler, a pastor of the Reformed Church, and Marguerite née Brucker, a pastors daughter. He had two sisters, Anna Maria and Maria Magdalena, and a younger brother Johann Heinrich. Soon after the birth of Leonhard, the Eulers moved from Basel to the town of Riehen, Paul Euler was a friend of the Bernoulli family, Johann Bernoulli was regarded as Europes foremost mathematician, and would eventually be the most important influence on young Leonhard. Eulers formal education started in Basel, where he was sent to live with his maternal grandmother. In 1720, aged thirteen, he enrolled at the University of Basel, during that time, he was receiving Saturday afternoon lessons from Johann Bernoulli, who quickly discovered his new pupils incredible talent for mathematics. In 1726, Euler completed a dissertation on the propagation of sound with the title De Sono, at that time, he was unsuccessfully attempting to obtain a position at the University of Basel. 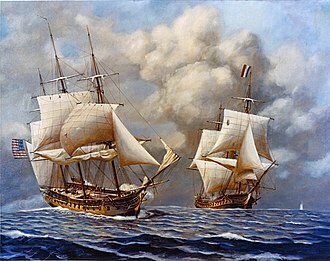 In 1727, he first entered the Paris Academy Prize Problem competition, Pierre Bouguer, who became known as the father of naval architecture and Euler took second place. Euler won this annual prize twelve times, around this time Johann Bernoullis two sons and Nicolaus, were working at the Imperial Russian Academy of Sciences in Saint Petersburg. In November 1726 Euler eagerly accepted the offer, but delayed making the trip to Saint Petersburg while he applied for a physics professorship at the University of Basel. The image above shows where average air temperatures (October 2010 – September 2011) were up to 2 degrees Celsius above (red) or below (blue) the long-term average (1981–2010). Bloody Falls in July 2007. The orthography and vocabulary of the Greenlandic language is governed by Oqaasileriffik, the Greenlandic language secretariat, located in the Ilimmarfik University of Greenland, Nuuk. The terrestrial globe of Gemma Frisius. The prow of Fram, as seen in the Fram Museum in 2010. For Amundsen's South Pole expedition, Fram was fitted with this diesel engine. 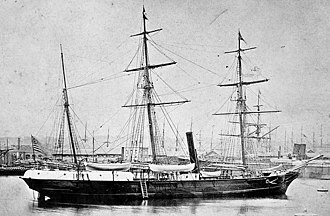 The Stella Polare was trapped and threatened to sink. The crew were obliged to land with the utmost haste and to secure materials for building a dwelling. 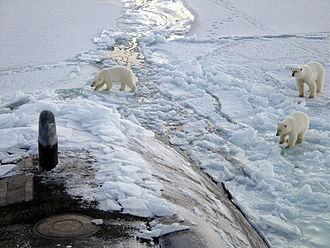 Three polar bears approach USS Honolulu near the North Pole. A sign at CFS Alert commemorating Alert as the northern-most permanently inhabited settlement in the world. The area has been inhabited since 1950. The opening of the Alert Background Air Pollution Monitoring Network in 1986. The remains of the Royal Canadian Air Force Lancaster 965, which crashed in July 1950. Difficult Arctic conditions makes landings in Alert hazardous. Broken pieces of Arctic sea ice with a snow cover. As ice melts, the liquid water collects in depressions on the surface and deepens them, forming these melt ponds in the Arctic. These fresh water ponds are separated from the salty sea below and around it, until breaks in the ice merge the two. Rare phenomenon – the formation of ball ice. Stroomi Beach, Tallinn, Estonia. Roald Amundsen led the first expedition to reach the South Pole, was the first person to reach both poles, and was the first person to traverse the Northwest Passage. 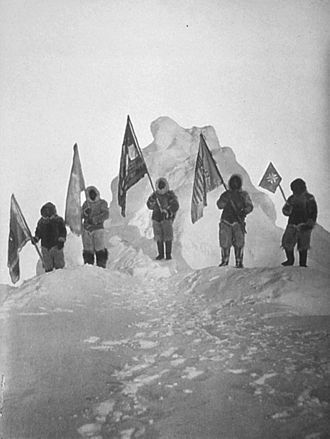 Robert Peary and sledge party with flags at North Pole. Peary has been claimed to be the first person to reach the North Pole. This long-exposure photo of the northern night sky above the Nepali Himalayas shows the apparent paths of the stars as Earth rotates. Starry circles arc around the south celestial pole, seen overhead at ESO's La Silla Observatory. 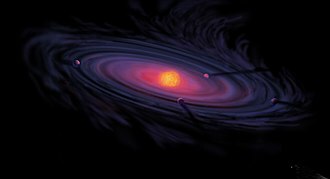 An artist's rendering of the protoplanetary disk. Airy isostasy, in which a constant-density crust floats on a higher-density mantle, and topography is determined by the thickness of the crust. The flukes of a narwhal in a Baffin Bay polynya. Örnen (The Eagle) shortly after its descent onto pack ice. Photographed by Nils Strindberg, the exposed plate was among those recovered in 1930.